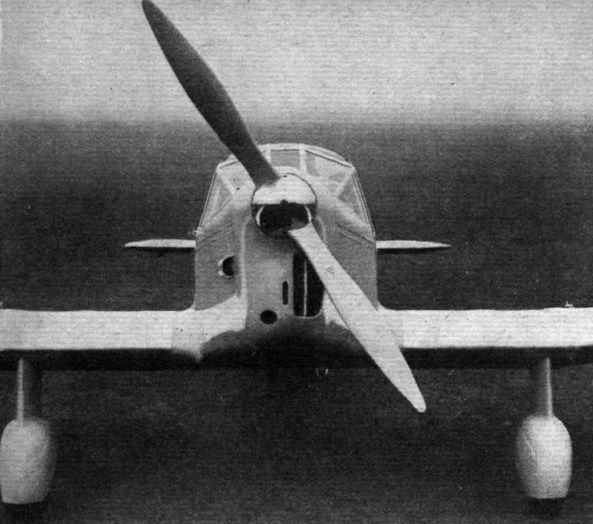 Четырехместный Type K.1 Vega Gull совершил полет в ноябре 1935 года, он имел двойное управление, закрылки и такой же двигатель, как у Gull Six, а на более поздних моделях ставились двигатели Gipsy Six Series II мощностью 205 л.с. Vega ДальшеMore>>> Gull достигли нескольких успехов в гонках и полетах на дальние дистанции, всего было построено 90 машин (последняя - в июле 1939 года). Машины продавались в Австралию, Канаду, Индию, Ирак, Японию и Кению. Они использовались для связи, а позже были усовершенствованы в вариант Proctor. ESSENTIALLY the new Percival Vega Gull follows standard Percival practice, and might, in fact, be regarded as a scaled-up and cleaned-up Gull. It is notable chiefly because it carries four people, with a high degree of comfort, at a speed barely 5 m.p.h. less than that attained by last year's three-seater Gull. An increase of 15 sq. ft. in wing area keeps the landing speed down to the 45 m.p.h. of the smaller machine. The fuselage, which is 9 in. 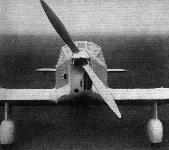 longer than that of the Gull, has a spruce framework and plywood covering. A thin cotton fabric known as nainsook, or madapollam, is applied, protecting the ply and forming a base for the Titanine finish. The cabin is 44 in. wide and its four seats are arranged in pairs, the two front seats being of the bucket type. The rear pair is luxuriously upholstered and provided with armrests. 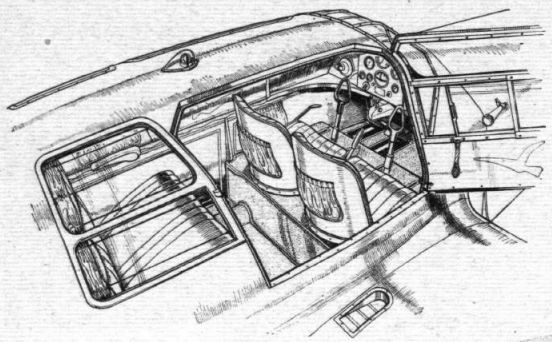 Soundproofing - which, like the upholstery, is the work of Rumbold - is incorporated, and from all viewpoints the cabin is comparable with that of a saloon motor car. There is a door on each side of the cabin and windows of splinterproof glass. Dual controls are optional, as are the electric starter and sun blinds fitted to the machine demonstrated the other day at Gravesend Airport by Capt. Percival. Luggage is carried in a separate compartment behind the cabin. Smith's instruments are fitted, and there is a Reid and Sigrist Gyorizon. 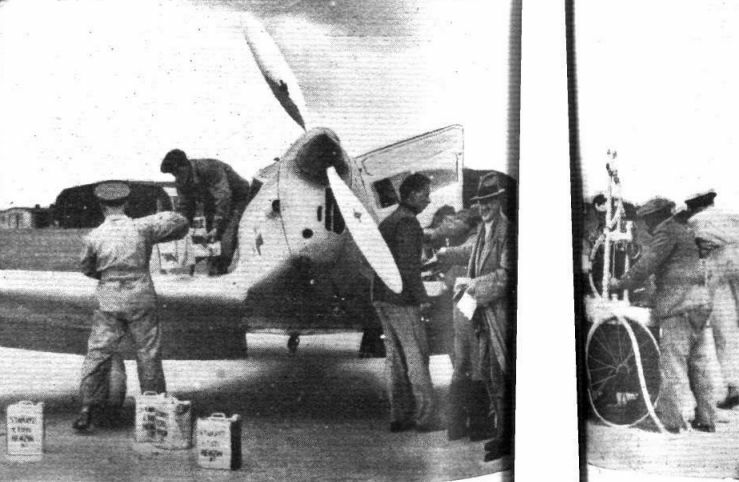 As in the 1935 model of the Gull, fresh air is taken to the cabin from a small scoop on the starboard wing. Provision has been made for the installation, if necessary, of a simple heating system from the exhaust. In span the wing of the Vega Gull measures 3 ft. 4 in. more than that of the Gull. Structurally, however, it is identical, having spars of spruce and plywood, lattice bracing of spruce, ribs of the same material and fabric covering. The locking device for the folding wings has been improved and now embodies a disappearing tommy-bar in place of a fixed extraneous handle. 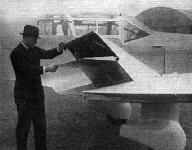 Two 20-gallon petrol tanks are housed in the wing, as in the Gull, and allow a range of 620 miles. 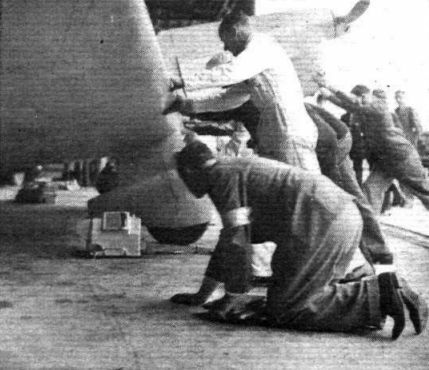 The external actuating levers for the ailerons have been done away with in the name of aerodynamic cleanliness. Cleaning-up is also apparent in the undercarriage (which, incidentally, now has a 6 1/4 in. travel, compared with the 5 3/4 in. of the older model), the small bracing strut from the compression leg to the spar having been eliminated a la Mew Gull. Wheels and tyres, as previously, are Dunlop and Bendix respectively. The pneumatic tail wheel is completely orientable and self-centring and is carried in a fork. A Gipsy Six engine of 200 h.p. 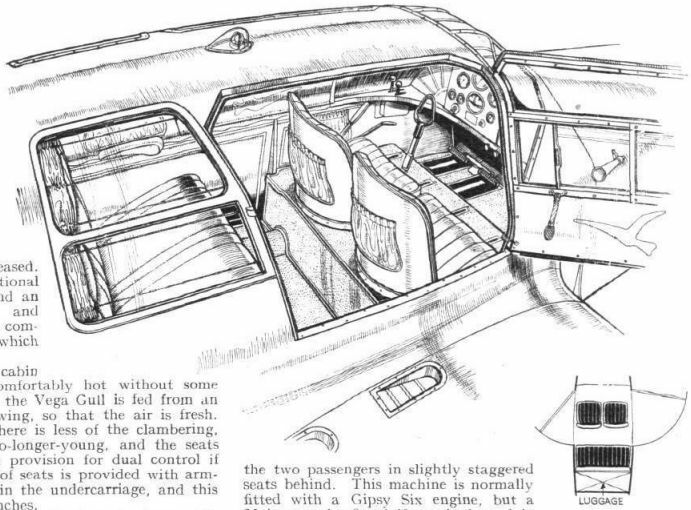 is fitted as standard, and a De Havilland or Ratier controllable-pitch airscrew is optional. The installation of one of these benefits take-off and cruising speed. 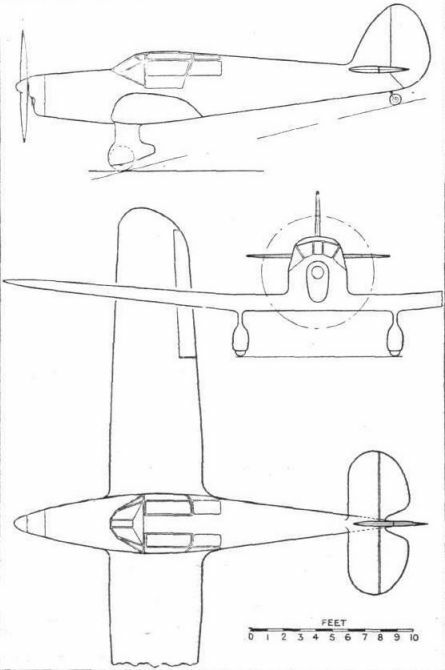 The split trailing-edge flaps are generally similar to those of the Gull (this means that they do not extend across the bottom of the fuselage and are worked by a lever on the port side of the pilot), but are increased in span and chord. Not more than a 10 lb. pull is required for their operation. 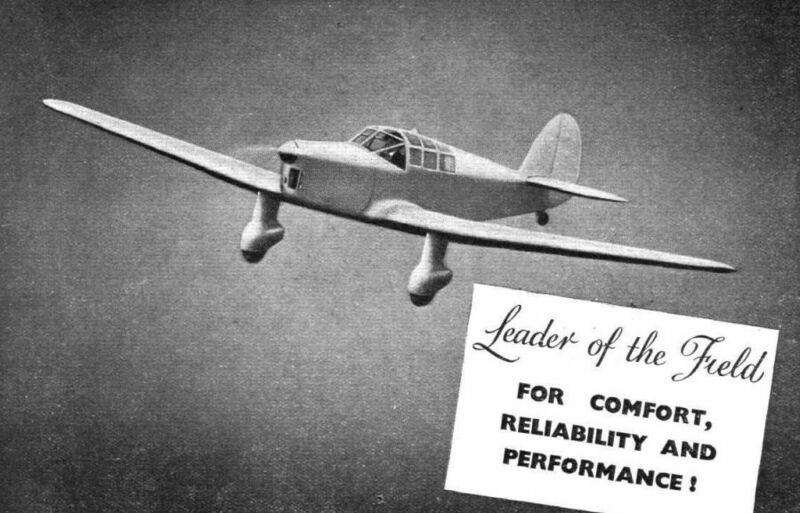 Such beneficial features as the new type of undercarriage are being incorporated in the 1936 model of the Gull, the maximum speed of which has been increased about 4 m.p.h. D.H. Gipsy Six, 200 h.p. LATEST of the Percival Gull series, the Vega Gull may be described as an enlarged Gull, though the comparison does not end there. It is both scaled-up and cleaned-up, and carries four people in considerable comfort at a speed barely 5 m.p.h. lower than that attained by the standard three-seater. An increase of wing area has kept the landing speed down to the same figure as before, and the area of the split flaps has been increased. Electric starters are an optional fitting, as are a cabin heater and an R.T.E. homing equipment, and luggage is carried in a separate compartment, behind the cabin, which is reached from the outside. The majority of low-wing cabin machines tend to become uncomfortably hot without some form of ventilator, and that on the Vega Gull is fed from an aperture well outboard in the wing, so that the air is fresh. 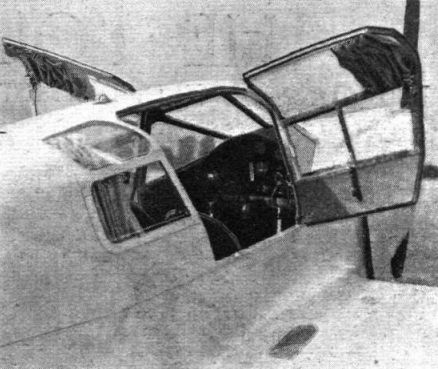 Two doors are fitted, so that there is less of the clambering, which is so irritating to the no-longer-young, and the seats are arranged in two pairs with provision for dual control if this is required. The rear pair of seats is provided with armrests. Cleaning-up is apparent in the undercarriage, and this has a travel of more than six inches. 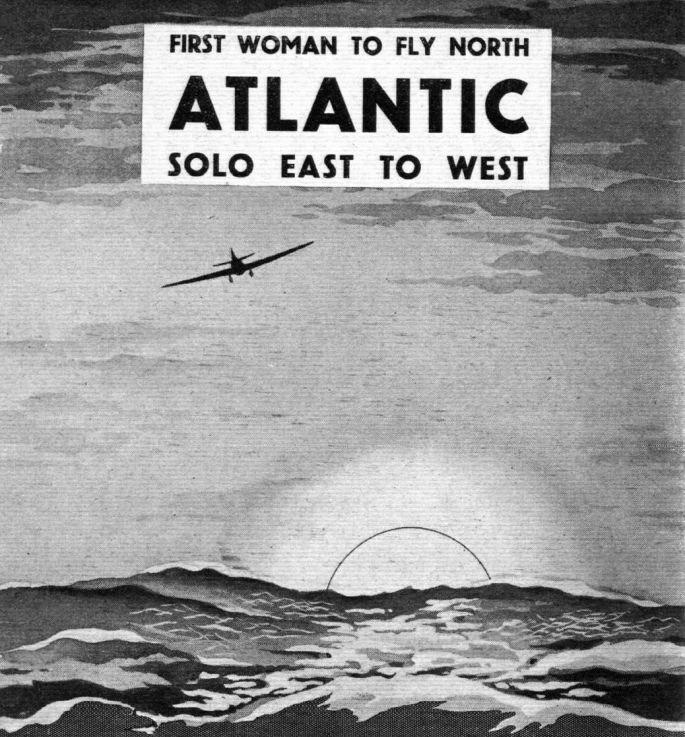 In the case of the Gull the pilot sits alone in front with the two passengers in slightly staggered seats behind. This machine is normally fitted with a Gipsy Six engine, but a Major can be fitted if required, and in this case the cruising speed is 133 m.p.h., against the 155 m.p.h. of the normal type. The specification of the Vega Gull is as follows: Weight empty, 1.575 lb. ; disposable load, 1,175 lb. ; span, 39ft. 6in. ; length, 25ft. 6in. ; maximum speed, 170 m.p h.; cruising speed, 150 m.p.h. ; stalling speed, 45 m.p.h. ; ranges 620 miles; price, ^1,550. 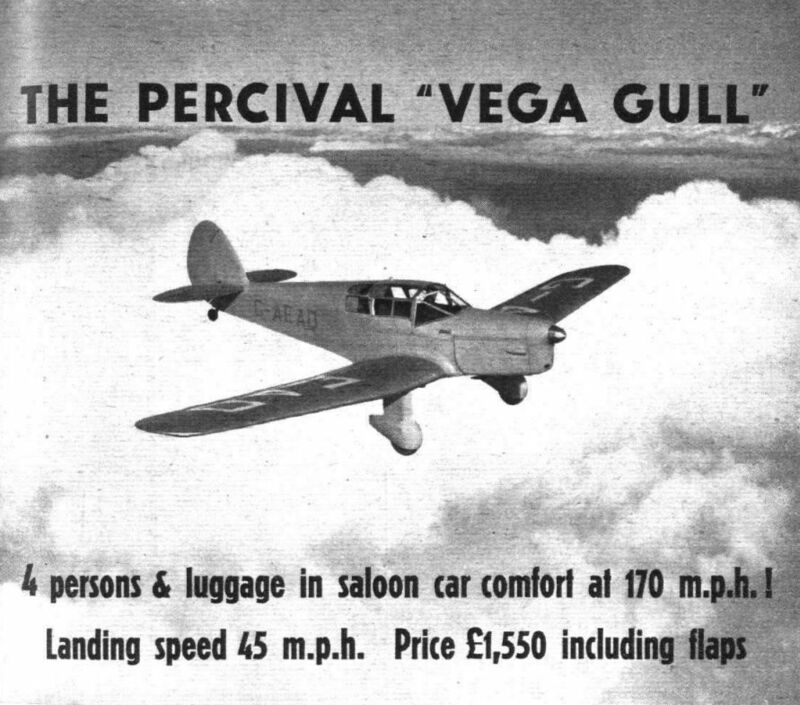 THE Percival Vega Gull is a development of the standard Gull, built on generally similar lines, but with a wider fuselage designed to accommodate four passengers, though in the case of the race-winning machine the two vacant seats were sacrificed to extra fuel tank space. 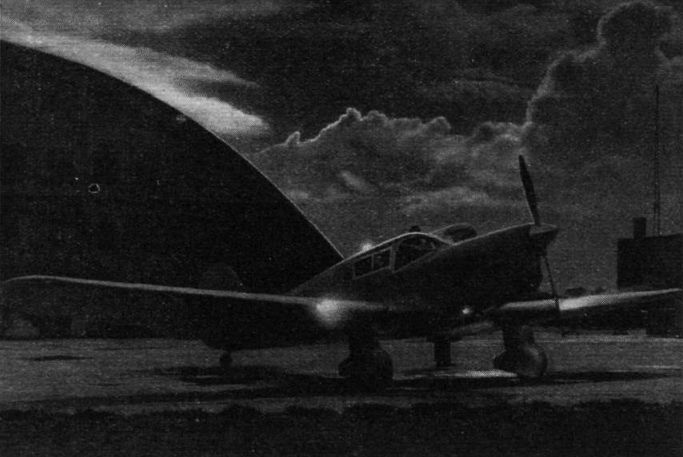 A low-wing monoplane, it is of the normal Percival wooden construction, with trousered and spatted undercarriage and fitted with trailing-edge flaps. The cruising speed of the standard model with the 200 h.p. 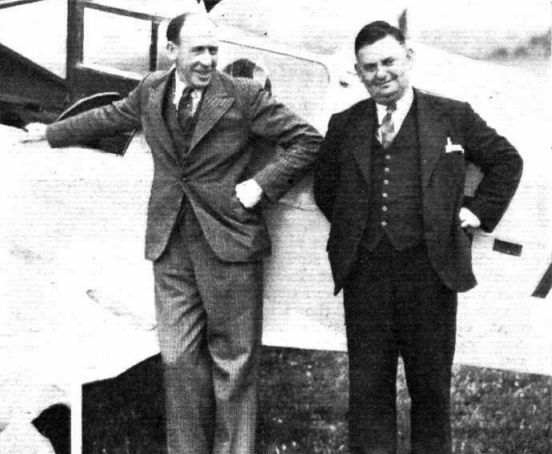 D.H.Gipsy Six engine is 150 m.p.h., but the Series II Gipsy Six and D.H variable-pitch airscrew, as fitted to Scott's machine, increase this figure very considerably. The winner's special tankage arrangements consisted of two tanks in the outer wing panels containing 20 gallons each, two more in the centre section holding 14 gallons each, and a fifth in the cabin of 28 gallons capacity ; this made a total of 96 gallons, which was calculated to give a theoretical range of 1,500 miles. The Series II Gipsy Six engine with which the machine is fitted is a version of the successful and well-tried Gipsy Six, but adapted for use with V.P. airscrews and utilising high-octane leaded fuels. The outstanding feature of its performance is a higher consistent output over the cruising range and a notable increase in take-off power, made possible by the use of the V.P. airscrew. The six cylinders have a total capacity of 9.186 litres and a compression ratio of 6:1. The crankshaft runs in eight main bearings, with a ball thrust bearing at the front end. The valves - the exhaust valves are of the Stellited type - operate on steel seats having a high coefficient of expansion, made necessary by the emplovment of high octane fuel. 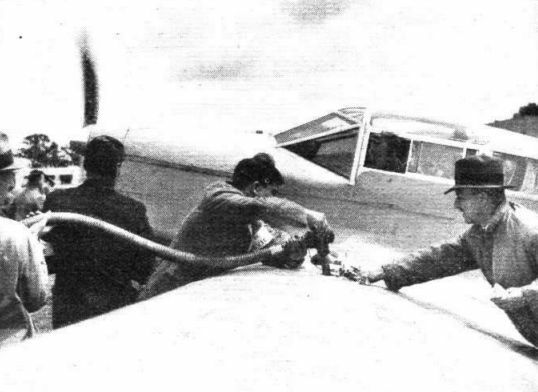 Two downdraught carburetters each supply three cylinders and draw warm air from around the cylinders at cruising speed, a flame trap being interposed. When the throttle is fully open a change-over flap is moved and air is taken from outside the cowling. This obviates any risk of freezing at cruising speeds, yet there is no loss of performance at full throttle. A gear-type oil pump supplies oil at a pressure of 40 to 45 lb./sq.in., the main stream going via the crankshaft and subsidiary streams lubricating the valve gear and auxiliary drives. Two scavenge pumps draw oil from each end of the crank case. With a V.P. airscrew the engine develops a rated output of 205 b.h.p. at 2,400 r.p.m. Fuel consumption is 11 1/2 gallons per hour, cruising at 2,100 r.p.m., or 16 gallons per hour at full throttle (2,400 r.p.m.). Oil consumption is 3 to 5 pints per hour at 2,100 r.p.m. 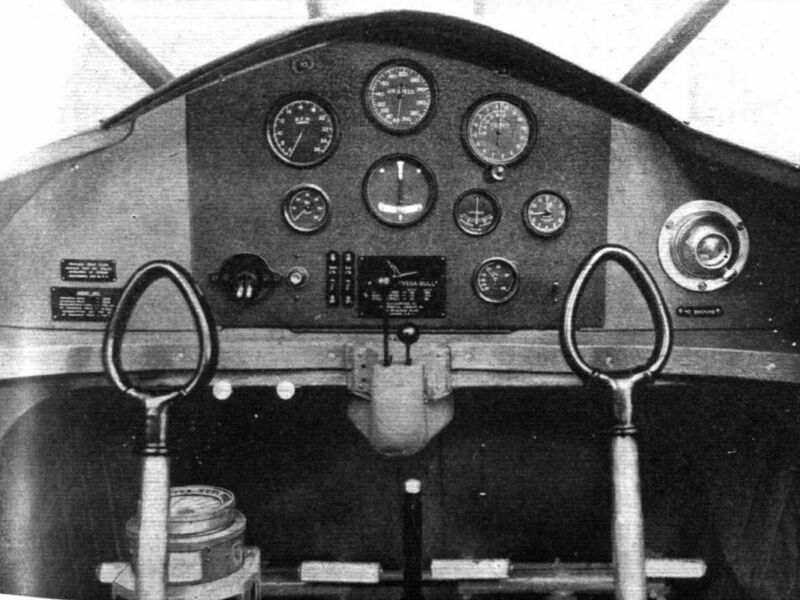 The proprietary equipment of the machine included the following: Smith's engine instruments; two Husun compasses, types P3 and P4; Reid and Sigrist turn and bank indicator; Sperry artificial horizon. A Rotax battery supplied current for the Vickers landing light and Demec navigation lights. The wheels and tyres were Dunlop, and Bendix brakes were fitted. 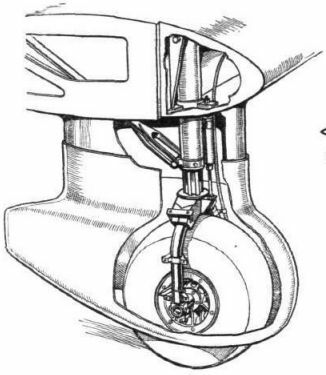 The Percival undercarriage embodied legs by Automotive Products. 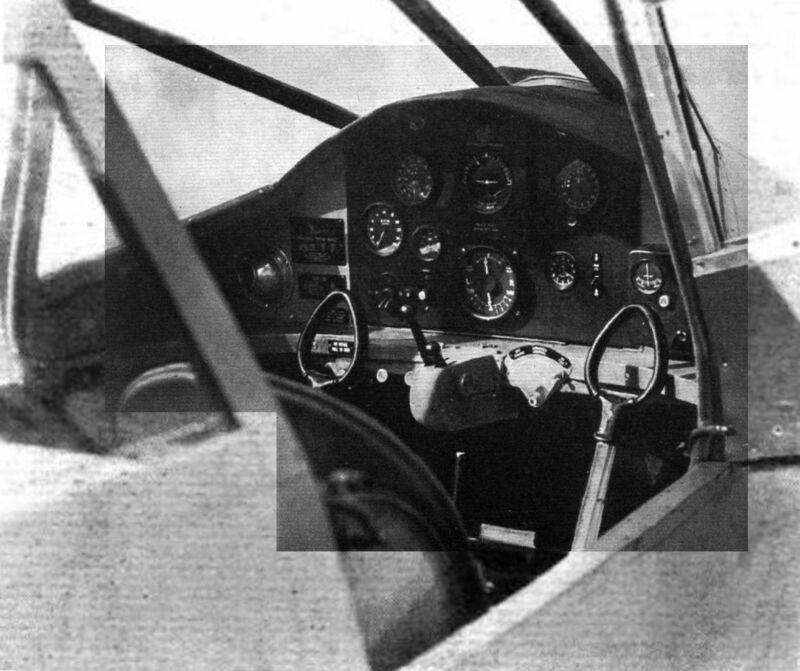 In the construction of the airframe the spruce was by Bamberger, and plywood was by Flexo and Aeronautical and Panel Plywood. Reynold's special tubing was also employed. The finish was in Titanine dope. 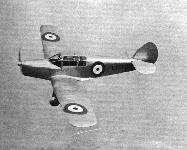 Upholstery was by Rumbold, the cabin top was Rhodoid, and the windscreen was of Splintex. Proprietary engine components and accessories included a crankshaft made of steel supplied by the English Steel Corporation, a camshaft by the Weyburn Engineering Co., and white metal bearings by Hoyt and the Eyre Smelting Co.; Wellworthy piston rings were fitted, and the valve springs were Salters'. B.T.H magnetos, driven through Simms flexible couplings, supplied current to K.L.G. plugs via cables made by British Insulated Cables, Ltd., and the H.T. terminals were by Chater-Lea An Amal petrol pump supplied fuel to the Claudel-Hobson carburetters, to which Amal flame traps were fitted. Other ccessories included gaskets by Hall and Hall, and Cooper's Mechanical Jointing; Robertson's "Jubilee" hose clips; oil-resisting rubber by the Northern Rubber Co., Dermatine Co., and Lyne Hancock; liquid jointing material by Held Glue and Compounds, Ltd., and the Kenilworth Manufacturing Co.; and engine paint by Pinchin Johnson. The 87-octane fuel was Shell (supplied via Vickers four-way petrol taps), and the oil was Castrol. Pictured at its new base at White Waltham, Vega Gull G-AEZJ is now flying following rebuild with Cliff Lovell near Salisbury, Wiltshire. 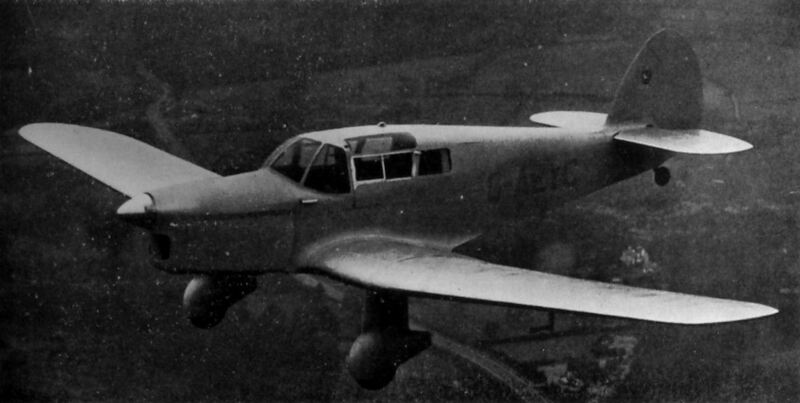 The Vega was first registered G-AEZJ in the UK in July 1937 before being exported to Holland. The aircraft arrived in the UK from Sweden in 1987 for restoration, after spending its time in Europe registered PH-ATH, D-IXWD and later SE-ALA. The Percival "Vega Gull" Four-seat Cabin Monoplane (200 h.p. D.H. "Gipsy-Six" engine). 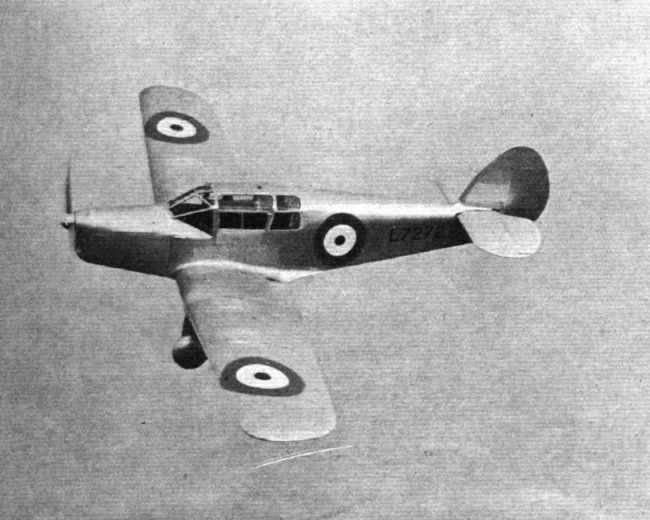 A Percival Vega Gull (Series I Gipsy Six) which is at present being shipped out to Buenos Aires for the use of the British Air Attache there, Group Capt. A. J. Miley, and his assistant, Sqn. Ldr. P. C. Wood. A Vega Gull is already in use by the Attache in Berlin, Group Capt. F. P. Don. ECONOMICAL TRANSPORT: A pleasant impression of one of the new Percival Vega Gulls above the clouds. With a Gipsy Six engine, this machine carries three passengers, in addition to the pilot, at a cruising speed of 150 m.p.h., and should prove popular for feeder line and charter work as well as for private ownership. A detailed description of the machine appeared in Flight of January 2. The Woolsington wind-sock gives some indication of the strength of the wind at the Newcastle control. The machine coming in is the Vega Gull flown by Miss Dillon and Capt. Neville Stack. All the Vega Gulls except one, as shown here, will have Series II Gipsy Sixes with D.H. v.p. airscrews. SCALED UP. This is the new Percival Vega Gull which was demonstrated at Gravesend last Thursday. Its fuselage and wing are larger than those of the standard Gull and there are four seats permitting side-by-side seating for two pairs of passengers. With a 200 h.p. Gipsy Six the maximum speed is 170 m.p.h. - perhaps rather more - and this fact, linked with the large capacity of the cabin, suits the machine for high speed charter work in addition to its function as an aerial saloon for private owners. IMPRESSIONISM: An effective portrait of Air Hire's new v.p. Vega Gull at Heston. This machine has a good deal of special equipment for night operations. Vega Gull - продолжатель линейки Gull Six. Данный самолет был приобретен британскими ВВС и дислоцировался на авиабазе Кеттерик. 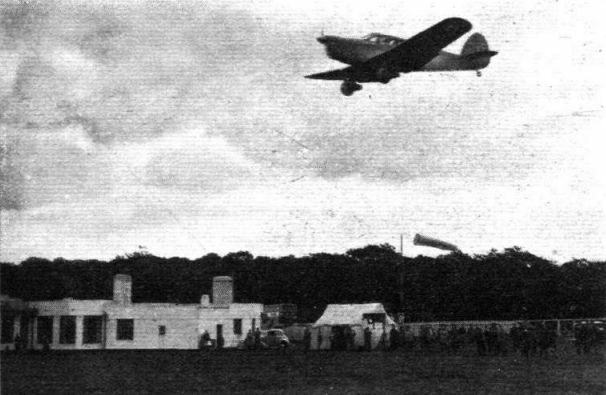 "... a quick inspection of the new control tower and buildings at Liverpool ..." The A.S.T. 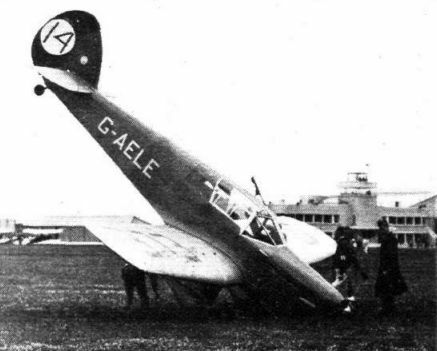 Dragonfly and Vega Gull on the tarmac at Speke. 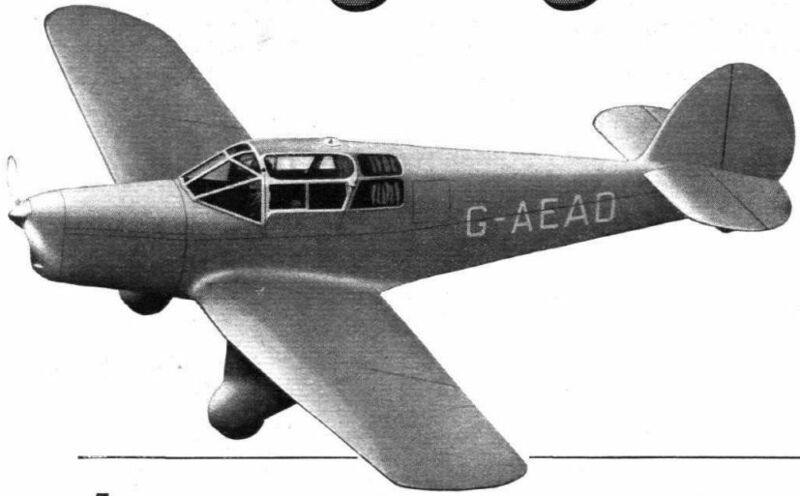 C. W. A. Scott's Vega Gull has a Gipsy Six II and variable-pitch airscrew. Mm. Pissavy and Cornet with their Vega Gull at Le Bourget last Sunday on their arrival from French Indo-China in record time. 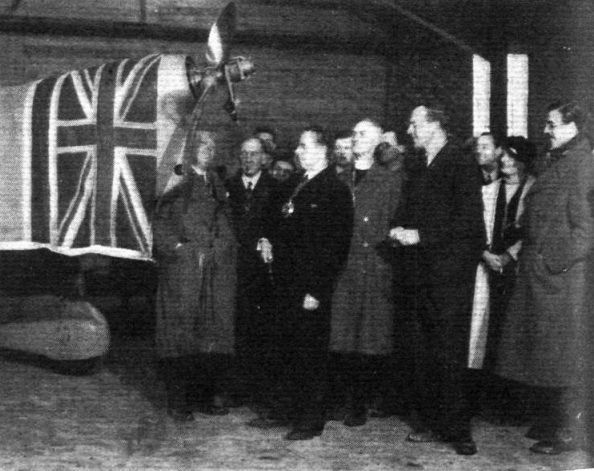 In second place: Mr. S. W. Sparkes and his passenger with their Percival Vega Gull. In spite of the large aggregate amount of sea-crossing, very few competitors took the precaution of wearing life-saving jackets. 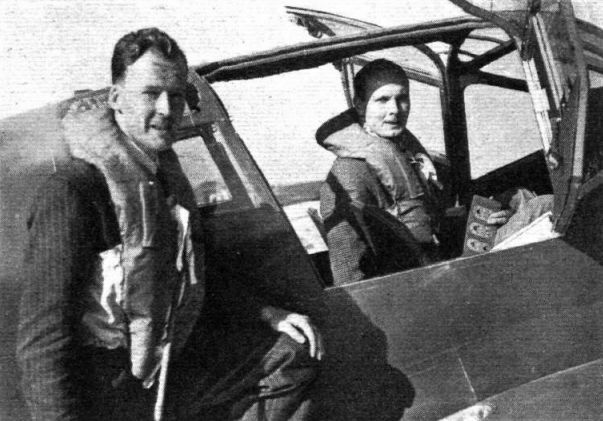 Derek Schreiber (right) and Flt.-Lt. Peel, his navigator, were among the exceptions. Two wide doors simplify, as far as possible, the business of entry into the front or rear seats of the Vega Gull. 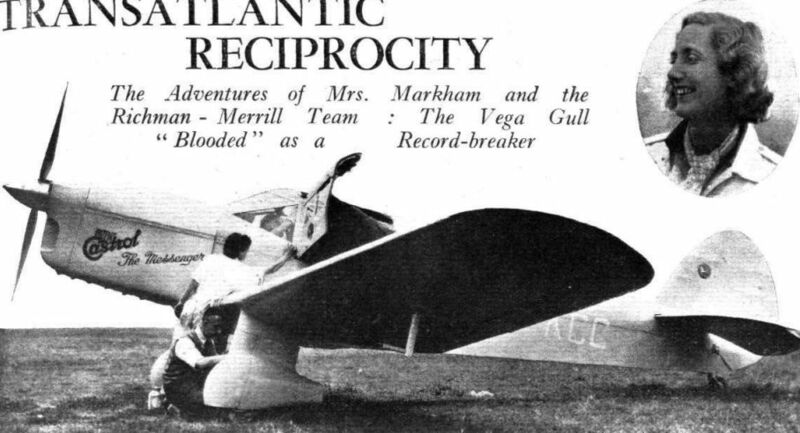 The Percival Vega Gull (D.H. Gipsy Six), which bids fair to emulate the memorable feats of the Gull. 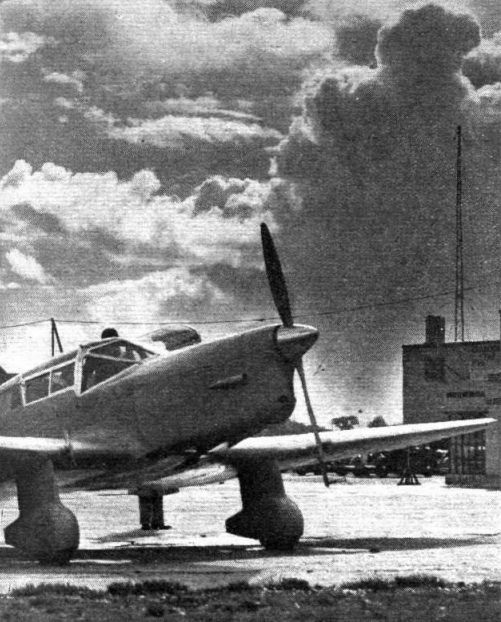 Note in this view the large spinner over the hub of the Ratier V.P. 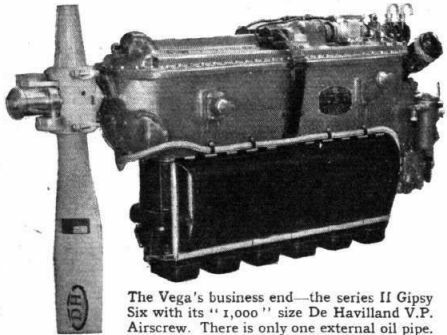 airscrew on the Vega used by Mrs. Markham (inset). 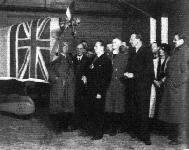 CEREMONY: At the new Percival works at Luton, and in the presence of the Mayors of Luton, Monmouth and Abergavenny, Mr. David Llewellyn's Vega Gull was last week christened County of Monmouth by the Mayor of Newport. The machine, which has a Gipsy Six Series II engine and v.p. airscrew, will be used for a Cape record attempt. It would appear that one of the distinguished visitors involuntarily shared the Vega Gull's champagne bath. The instruments and engine controls of the v.p. Vega Gull. 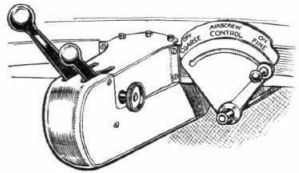 On the extreme right is the landing and navigation light switchboard, while on the left is the useful left-hand additional throttle lever. At the base of the dashboard can be seen (on the left side) the fuel pump, airscrew pitch and intake controls, with (behind the dua! stick) the flooding control. The gauges for the four fuel tanks are on the right of the dash, and the boost gauge is in the centre at the top.